Courtney Love moved out of her West Village, New York townhouse, last month, after winning her vicious, legal battle with her ex-landlord. Now, Courtney Love, 47, is hoping to a smoother domestic situation in her new home. Courtney Love is now living in a rented condominium in the Nolita district of Manhattan and is getting on famously with her new landlords. The singer revealed she is now living in “the Lafayette building – everyone calls it that – near the New Museum”. When Courtney Love moved in last month, she even got U2 rocker Bono to write her a character reference. So far, Courtney Love was only run into one clash with neighbors, when she was playing loud music, but has vowed to keep the volume down from now on after finding out one was pregnant. In January, Courtney Love won her legal battle against her Chicago-based landlady Donna Lyons, who had accused the singer of owing her $50,000 in rent. Judge Jean Schneider of New York County Housing cancelled the case saying Donna Lyons had improperly relied on outdated lease provisions. Courtney Love had been renting the $27,000-a-month townhouse on West 10th Street for 11 months, but has apparently not been missing payments. Her lawyer Eric Sherman said: “We are pleased with the court’s decision. 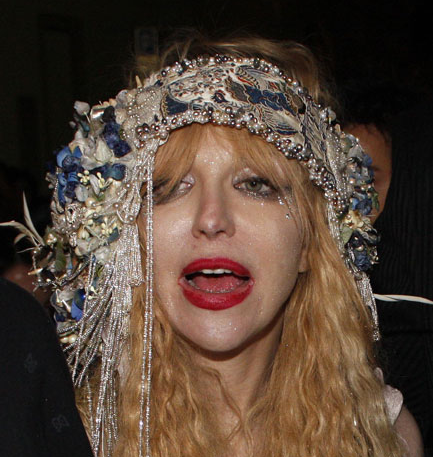 Given her recent tweeting, Courtney Love is very happy in her new abode.